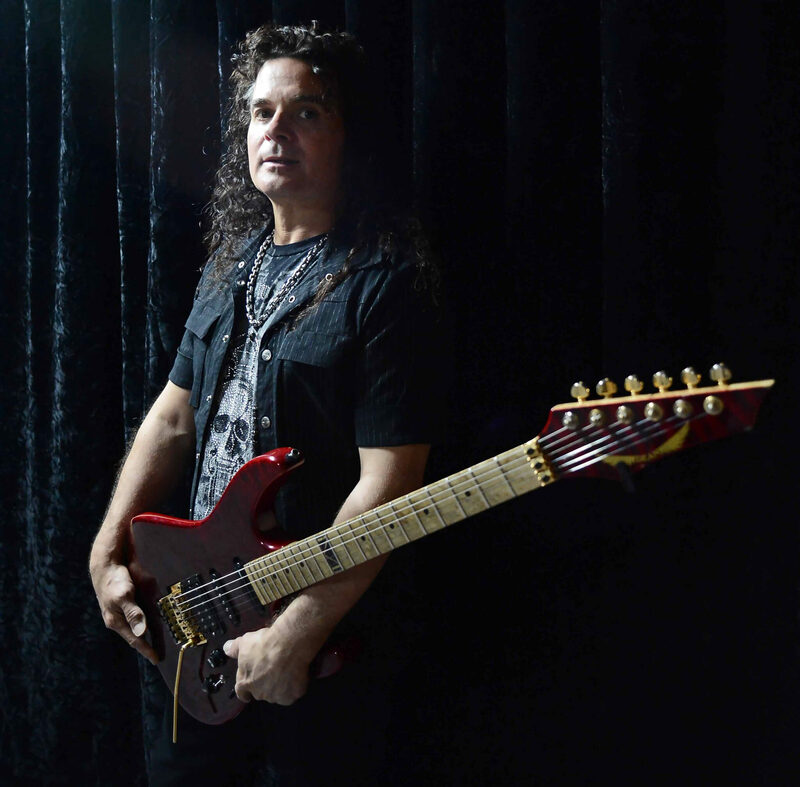 Vinnie Moore - The Man Behind The Strings - Welcome To All That Shreds Magazine! Eight solo albums, five collaborations, six UFO albums, two Hot Licks’ guitar video clinics, one virtuoso… Of course, we are referring to Vinnie Moore, the “Vin Man” as we the fans know him! He has accomplished quite a lot during his 30+ years of performance, but one wonders: who’s the man behind the strings? Well, to give you a proper answer in a few words is not fair to his career, so let’s take a look at those 30+ years of speed, accuracy, articulation and advanced lead guitar techniques! He was only 12 when he got his first guitar; a teenage boy who looked up to the great guitar legends of that moment. Records by the Beatles like their eponymous double album from 1968 (from which he has covered While My Guitar Gently Weeps many times), Jeff Beck’s ‘Wired‘, Led Zeppelin’s ‘IV Zoso’, Deep Purple’s ‘Machine Head‘ and ‘Burn‘, Queen’s ‘A Night At The Opera‘, Van Halen’s self-titled album and many other bands; all of them were among his early influences. His first guitar was a Teisco and made him, in the Vin Man’s words, a “guitar freak,” always improving and crafting his unique voice through his youth. After taking guitar lessons with a private instructor when he was 13, he started to put his skills to work by joining his first band, doing jam sessions and covers of their favorite songs in a typical setup of drums, bass, vocals and two guitars. From there on, he started to work on his ideas buying a 4-track tape recorder and experimented with many fragments, which later evolved into songs, showing his proficiency on the six strings. By 1985 Vinnie Moore already was a prolific composer. He decided to pursue an opportunity and sent some of his recorded music, in the form of a seven-song demo tape, to Guitar Player Magazine, and it caught the attention of Mike Varney and his Spotlight column in the said magazine. It turns out that Varney was also owner and producer of Shrapnel Records, and Vinnie’s talent didn’t go unnoticed to him. This event allowed him to get into a Pepsi commercial (see video below) thanks to a Los Angeles agency that saw Vinnie’s picture and submission to Guitar Player; and even when it showed his hands only, it made his sound reach a national audience, getting recognition as a new emerging talent from Delaware! In this commercial, we can hear an accomplished 23 years old guitar player showing his alternate picking technique: clean, accurate and fast. We can listen to every note during the scalar passages, the arpeggios, and the pentatonic licks being perfectly well played along the video. Also remarkable was his sense of climax during the finishing sequence opening the last Pepsi bottle where he pulled off a scalar running which ended up at a high E vibrato, a very neo-classical musical approach that he would go more in-depth into in his first album, but we are just about to get there! Following the repercussion of the Pepsi commercial, Vinnie Moore and Mike Varney started to work together in Shrapnel Records to conceive the Vin Man’s first album: ‘Mind’s Eye.’ The album was released in January 1987 and represented a milestone for virtuoso guitar playing of the moment for various reasons. With all the neoclassical hype at the moment, it is hard to stand out among a great number of imitators since it became so popular back then, and yet the Vin Man managed to pull out one single record that earned a deserved recognition by the specialized press, the critics, and other guitar personalities. Although there are some obvious references to the neo-classical style regarding harmony, chord progressions, harmonic minor scale and phrasing, we can hear progressive rock riffs (In Control’s opening, Saved by a Miracle for example), preference for modal harmony and a tendency to put melodic phrasing above non-sense runs all over the neck that were so popular back then (Daydream, Hero Without Honor). All these innovative elements were combined to bring a new, different and unique sound approach to the guitar world. Vinnie just did the alchemy and made an album that is modern guitar history for all generations that came after. Shrapnel Records opened a new world to this 23-year-old guitar virtuoso. By 1988, with the release of Time Odyssey, he took his game another level up by emulating and surpassing the success of his previous album, also parting from Shrapnel Records. The Vin Man’s experiments on the progressive, futuristic and melodic approach of virtuoso playing went even further to craft this masterpiece! The opening Morning Star fusion of classical and passionate melodic main theme’s phrasing, progressive cuts like Prelude/Into The Future or Message In a Dream (in collaboration with Jordan Rudess! ), George Harrison’s tribute to While My Guitar Gently Weeps, beautiful rock ballads like As Time Slips By that showed Vinnie’s musical sensibility…the whole album was the refined version of himself as a musician, an accomplished composer that also has the technical ability. This time Vinnie would go for a total reinvention of himself. By 1991 Vinnie Moore was a worldwide recognized musician and guitar artist, and his career would take a major turn with the Meltdown album. Vin decided to experiment with a groove-infused rock and roll style that became his signature for the following years, combining powerful riffs, virtuosic playing and an even more melodic tendency over the quick runs than his previous albums. The transition from metal to slow, mellow songs were smooth and remarkable (Meltdown, Earthshaker, When Angels Sing, Check It Out, Coming Home). And by 1996, when the grunge and alternative rock reign was at its best, Vinnie, once again proving himself a musician over a guitar virtuoso decided to go for an elegant instrumental approach for his next album, Out of Nowhere, which brought us memorable cuts that reflected Moore’s maturity as an artist: With the Flow, Echoes, Thunderball, Time Traveler, Move that Thang or this writer’s personal favorite VinMan’s Brew. The Maze in 1999 marked the Vin Man’s return to Shrapnel Records and what a comeback I have to say! It was considered by many critics an epic performance to his first two albums, with a modern and progressive approach that doesn’t leave out his accomplished musicianship. Memorable tracks? The whole album! However, special honorable mentions go to The Maze, Cryptic Dreams, Rain and Fear, and Trepidation. Excellence and perfection are in Vinnie’s blood. More albums came with an excellent backup personnel behind: his first live recorded album Live! in 2000 with Barry Sparks on bass (Yngwie Malmsteen, Michael Schenker, UFO), Shane Gaalaas on drums (Glenn Hughes, Jeff Kollman, $ign of 4) and Wayne Findlay doing keyboards (MSG also). In 2001 he followed The Maze’s trail and released Defying Gravity which had Dave LaRue on bass. Remarkable tracks from these periods: Check It Out (Live), She’s Only Sleeping (Live), Daydream (Live), Cryptic Dreams (Live), Defying Gravity, If I Could, Emotion Overload, Last Road Home. Taking a little break from the Vin Man’s great solo career we got a question to ask you: how cool would it be to play with one of the bands you loved as a kid? It would be incredible, right? That’s precisely what happened to Vinnie Moore in 2003 when he was recruited to play with one of the world’s most recognized rock acts: UFO, the legendary band that gave us such classics like Doctor Doctor, Rock Bottom, Lights Out (which is Vinnie’s favorite according to an interview), Love to Love and many others. Guitarist Michael Schenker left the band in 2002, and the Vin Man’s talent was required to enrich UFO’s sound. The idea was to relaunch the band career, and to do so they signed with SPV Records and producer Tommy Newton to work on the forthcoming album, You Are Here, for which Vinnie did significant songwriting work in 11 of 12 songs the album has. This collaboration proved successful, and it meant to him the most logical step in his career musically speaking, as he was joining the band he grew up listening to and crafting more solo material, he viewed this as a great opportunity that he took as soon as it knocked on his door. In addition to You Are Here, there are four more albums in which he has been playing and songwriting The Monkey Puzzle (2006), The Visitor (2009), Seven Deadly (2012) and A Conspiracy to Stars (2015). Remarkable tracks from the UFO new recordings, written by the Vin Man himself are: When Daylight Comes to Town, Mr. Freeze, Who’s Fooling Who, Stop Breaking Down, Year of the Gun, Devil’s in the Detail. Vinnie Moore, the excellent musician, is also a wonderful person. A very down-to-earth guy he likes to keep in touch with his fans via his Facebook account (which he manages) where he comments on his daily life and his projects, and he’s also supportive of new guitar material that many of his fans submit. Firsthand talking with them during his clinic time and shows is also important to him to see how they experience the music he creates; maintaining this contact enables him to connect with their energy, to create emotions in people doing what he loves most, all thanks to the art he considers as a gift. Regarding the technical aspect, Vinnie Moore has always been a guy ahead of his time. Impeccable alternate picking technique which seems clean in every passage of his discography; he gladly explains how to achieve this level of mastery via daily workouts in his 2 Hot Lick’s video clinics: Speed, Accuracy and Articulation and Advanced Lead Guitar Techniques. Vinny is also one of the precursors of sweep picking technique, being a constant musical resource during his early and most virtuosic repertoire. He shows a preference for the modal approach to music, in which he explores the many possibilities of the eight Gregorian modes of pre-tonal music and combines it with his rock and roll influences, as we can hear in many of his most popular ballads for example. When it comes to his gear, he has been working it out through the years and changing it regularly – as the search for the right sound never ends. Ibanez made for him a unique Roadstar model in 1987 called VM1, which was his trademark axe until he started to work with Music Man, which made first Axis and Silhouette models for him. In 2007 he is endorsed by Dean Guitars and developed a very productive relationship with them, crafting the instruments with his very own specifications, here’s a list of the models used by him: USA VINMAN 2000 which comes in Gloss Natural/Trans Amber/Trans Black/Trans Red and the unique Vinnie Moore Signature – Mind’s Eye design. Regarding amplification he relies on the good old Marshall JMP 2000 DSL, the always delightful Marshall JMP 100w head and ENGL amps to get his particular tone. As for today, Vinnie released his latest production Aerial Visions last year under his label, Mind’s Eye Music, and in the VinMan Studios. In this album, he takes his music even further by exploring his most melodic side in songs like Faith or Looking Back. It was created during part of his development of UFO’s new material for their most recent album, and as a matter of fact, two songs made for this album were heard by Phil Mogg, who wrote lyrics to it and were also included them in A Conspiracy of Stars. Aerial Visions represents another point of inflection in his career due to the wide variety of styles explored in this record in cuts like Mustang Shuffle, Aerial Vision and his tribute to ZZ Top’s La Grange. As you can see, there’s just so much more than meets the eye in the career and style of the Vin Man, a creative musician who reinvents himself in each new production and is always in the search for real, emotional and memorable guitar music. Vinnie Moore is one of the best guitarists and a real inspiration for all of us guitar players!